This meditation will assist you in navigating your way though this time of great upheaval on the planet, allowing you to remain calm and centered regardless of what is happening in the outside World. "In the Flow" and "Metamorphosis", also available for download. Peter leads weekly meditations in Victoria BC using guided visualizations of alchemical transformation for personal healing, as well as activating our DNA for higher consciousness. Peter's scientific and metaphysical background creates the ideal blend necessary for you to learn how to meditate and to manifest your deepest desires. Each meditation works with the cosmic energies, current planetary alignments, and the rhythmic cycles of the natural world to bring peace to our beautiful planet. From Cook, up the driveway, through the lattice gates, to the studio around the back. Parking on the west side of Cook Street. For each week's meditation topic, please join our email list by request to descendingdove@gmail.com and you will receive regular updates. There's also a ﻿Victoria Meditation Meet-Up﻿ group for weekly meditations, where you can receive updates as well as RSVP - please join if you feel called! The Thursday morning Meditation will be similar to that of Monday evening. The experience will be new for those who were not able to attend the evening session and an expansion for those that choose to attend both. Private Residence of Alice King - White apartment complex on the south-west corner of Rockland and Lymann Duff. and put your CD in the mail. with links for your download. As soon as we receive your payment, we will send a confirmation email with links for your download. Looking to discover a greater sense of peace in your life, but unwilling to break out of your cozy winter shell? Try some meditation at home instead. Now, if you’re like most people in this crazy ol’ modern world, your idea of meditation is more likely that dead space between the cell phone ringing and your next oh-so-important appointment—you know, those moments where you just find yourself zoning out and staring at the floor. Sorry, but that doesn’t really cut it. I’d suggest a slip of the tongue—Peter Tongue, that is. 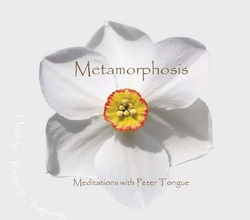 Tongue, a former high school principal who has also been leading local meditation groups for the past 20 years, has released a pair of inspiring and practical meditation CDs: the healing-based Metamorphosis, and the performance-enhancing In The Flow. With a smooth delivery, soothing tone, peaceful music and undeniably inspiring and easy-to-follow messages, these are both good CDs that can’t help but improve your outlook on life. Whatever your high-performance arena—competitive sports, the performing arts or academic exams—Tongue’s words really do seem able to help us cope more effectively with the stresses of life. (I slipped it on when I had multiple deadlines looming, and found myself worried not a bit.) As well as a simple and understandable 10-minute introduction, Flow includes the pivotal 51-minute “Meditation for Peak Performance,” as well as a five-minute pre-performance refresher visualization and the 15-minute the deep rejuvenating sleep (because we all need better sleep). As he says in the introduction to the “Meditation for Peak Performance” on Flow, “It doesn’t matter how many times you practice the skills, it is the emotional readiness that will decide whether you perform successfully or not. By sitting back in meditation, taking your time, you can prepare yourself before the event.” Too true. 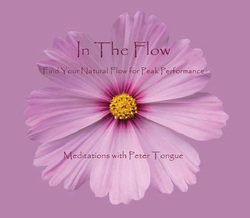 Visit www.petertongue.com to find out more, or hear audio samples of these excellent meditative tools.